EMDR stands for "Eye Movement Desensitization and Reprocessing". It is a form of psychotherapy in which individuals experience relief from trauma and emotional distress by the use of bilateral stimulation. This bilateral stimulation was originally done through eye movements yet can also be achieved through tapping, listening to sound, or tactile stimulation as seen in the picture (left). EMDR works on the premise that the mind can recover from psychological trauma just as the body can heal from physiological trauma. We have an innate ability to heal. Our body has the internal wisdom to heal an open wound by vasoconstriction to reduce blood flow, then sending in platelets to adhere to the open wound and functioning like a plug, and last to hold the platelet plug in place via clotting proteins. Our body does that all on its own just like we breathe automatically and our heart pumps blood through our body without us giving it directions. Trauma gets fixated in our nervous system and affects us how we view ourself in the world. The result is often negative self-talk such as "I'm not good enough," we may feel depressed, and experience fears & phobias. Other experiences such as abuse, neglect, accidents, surgeries may result in a single trauma yet may also be clustered together to a bigger trauma and may also lead to PTSD. Early attachment experiences form a template of how we feel about ourself as well as others. Relationship issues may arise and we wonder why we are co-dependent or why we always date the same kind of individual. In EMDR, the therapist functions like a "midwife" who supports when necessary the natural flow of birth. In EMDR, the client "gives birth" to a new sense of empowerment, a new set of beliefs about the vast possibilities and strength of inner resources. A feeling of wellness and wholeness occurs organically. EMDR uses protocols to restore mental & emotional balance by working directly with the subconscious mind or our right brain hemisphere. It is by tapping into the higher self of the right brain hemisphere that we feel joy and happiness, feel the connection to the cosmic flow and with that to all that exists. It is in our left brain that we formulate judgment and negative self-talk, make connections and place labels on experiences of the past. It is also in our left brain that we experience the past as the past and worry about the future. The right brain on the other hand only feels each experience in the present moment. 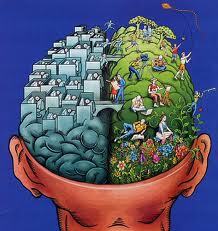 By integrating the right & left brain hemispheres, we are able to make new connections and form new neuro-pathways. These new connections allow us to gain new awareness and a deeper understanding and with that, gain a new perspective that fosters healing and a positive outlook. If you have an open lawsuit due to filing for damages, please check with your lawyer whether EMDR is good for you. You may just feel better thus not experiencing any symptomatic. Only if both hemispheres work together do we understand that he have to put our socks on first before we put on our shoes. Our right hemispheres sees a rainbow as natural wonder and feels connected to its energy while our left hemispheres labels it as "beautiful," and separates each color.